As the ocean waves break against the rocky cliff, the lighthouse silently stands watch. 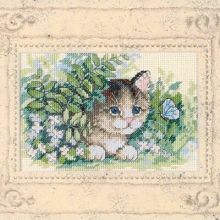 Kit contains cotton thread, 14 count beige Aida, precut printed mat, needle, and instructions. -- Finished Size: 8" x 10" (20 x 25 cm)..
Dove held in the hands bound in passe-partout. Image from the collection of company JCA. Kit includes: Aida 14", gray-purple, sorted thread, beige passe-partout, needle, pattern and instructions in English and French . "..